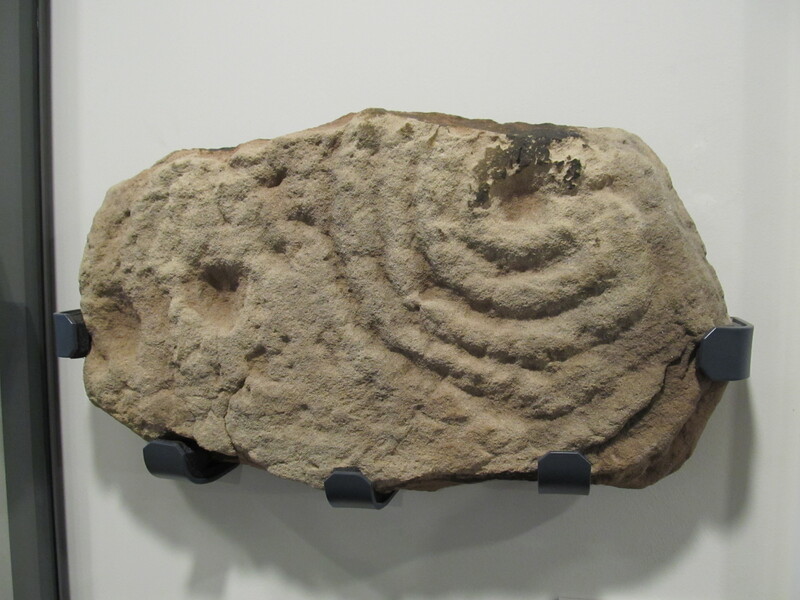 Display of cup and ring-marked stones in the basement of the National Museum of Scotland in Edinburgh. 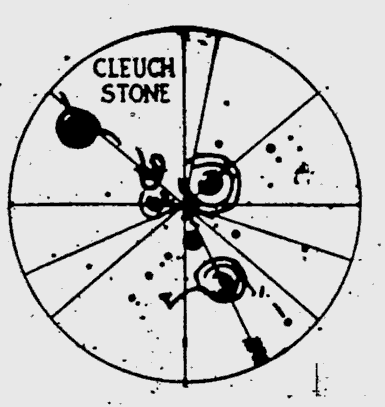 The lower stone is from the actually-existing village of Lamancha, 12 miles East of Little Sparta; behind it, partly obscured by the Lamancha stone, is the cist cover from Wester Yardhouses, 2 miles west of Little Sparta. Little Sparta cannot be seen. This entry was posted in sharing little sparta and tagged sharing little sparta on 27/08/2016 by Peter Manson. 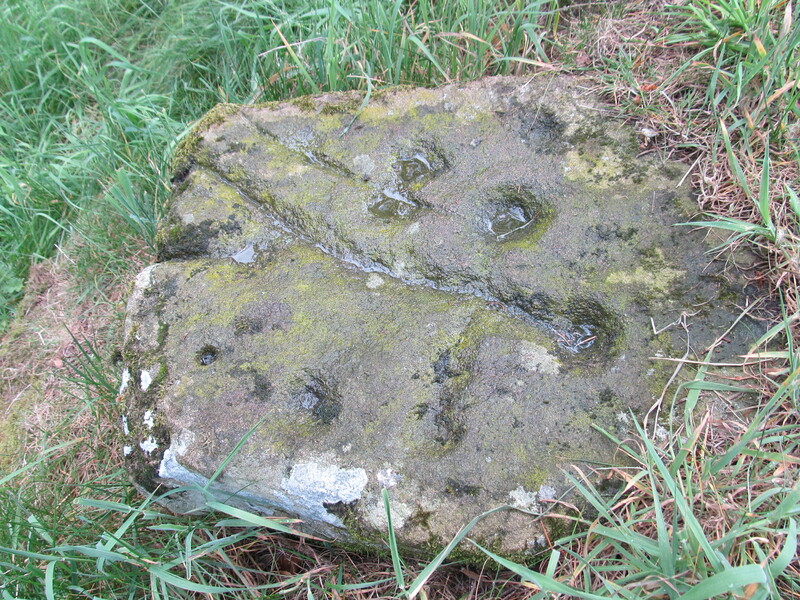 Cup and ring-marked boulder at Glencorse Parish Church, near Penicuik. The stone is said to have been found on a hill near the 17th century Glencorse Old Kirk, and moved to the new church when it was built in the 1880s. Another cup-marked stone was reported at the Old Kirk, but has been lost, and the Old Kirk itself is now difficult to access, having become part of the backdrop to an upmarket wedding venue at Glencorse House. Yet another cup-marked stone was built into the wall of an iron age earth house or souterrain, dug into the ramparts of Castle Law hill fort, now on the edge of a military training area a mile or so north-west of Glencorse. 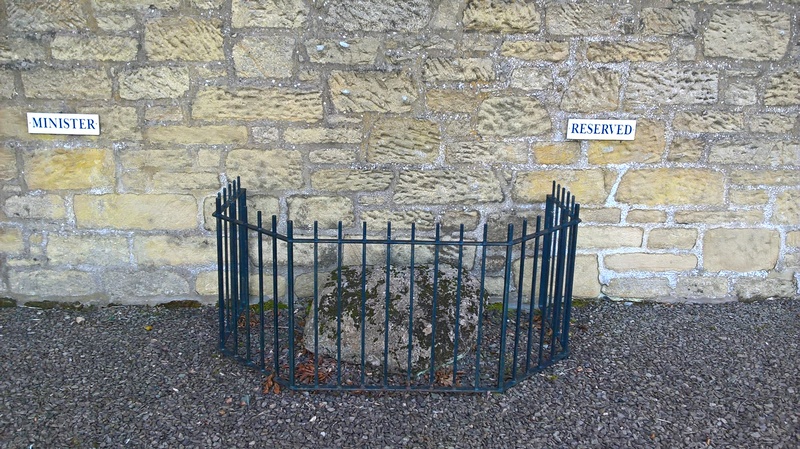 The Glencorse stone sits between two parking spots, inside a low iron fence, presumably protecting it from the cars, or the cars from it, though the symbolism of a pre-Christian monument caged by the wall of a church doesn’t need pointing. Nobody really knows what the cup-and-ring marked stones mean — the current best guess seems to be that they mark places where gold or copper was mined in Neolithic or Chalcolithic times. 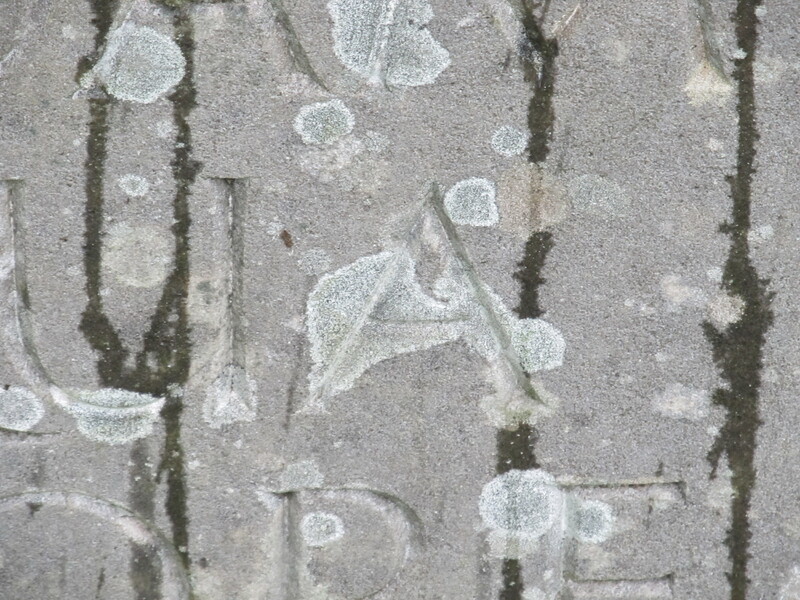 Like the stones carved with single words or names at Little Sparta, their meaning is a composite of the properties of the carved stone and its context in the landscape — a context which this uprooted stone no longer has. Even for a latter-day stone-botherer, much of the impact of rock-art depends on its environment. The carvings are often indistinct, and best viewed in low, slanting sunlight, which is a scarce visitor to the north-east facing wall of Glencorse Parish Church. The cup-marks are certainly ancient, but the stone is right on the lip of an old quarry, its edges trimmed flat, and the rough carved cross on top may be a relatively recent example of Christianizing join-the-dots, turning a disquieting idol into a monument to be left alone. The article is by Ludovic MacLellan Mann, a celebrity amateur archaeologist of the time, and interprets the stone as a record of the solar eclipse of 2983 BC, which it probably isn’t. As if in embarrassment, the stone disappeared. According to Canmore, the club secretary was able (in 2007) to point to a grass-grown outcrop as a place where the carvings may once have been. The archived site reports on Canmore often read like reports of a kind of very slow weather, with stones appearing and disappearing, lost and found, mislocated and relocated at intervals of decades or centuries. NS 2965 4581. A workman at the mill, who pointed out it[s] position stated that the stone was built into the culvert of the lade some years ago, and is covered by the road which runs over it. Enquiry at Dalgarven Mill confirms that the stone is still placed as stated. Its approximate position in the culvert, some 20m long, is not known. I can imagine the two stones, original and reproduction, meeting again at the general resurrection of stones, when we have bombed or drowned ourselves back to a time where stone is what we mostly have to work with. The reproduction stone, protected only by the cover of turf which will soon overtake it, will be barely legible; the much older original, a portrait-in-the-culvert, may look as suspiciously fresh as it did in 1895, maybe trimmed just a bit to fit the culvert. We’ll smash them both to red gravel and make a path. This is a post about Ian Hamilton Finlay if I say so. This entry was posted in sharing little sparta, Uncategorized and tagged sharing little sparta on 27/08/2016 by Peter Manson. 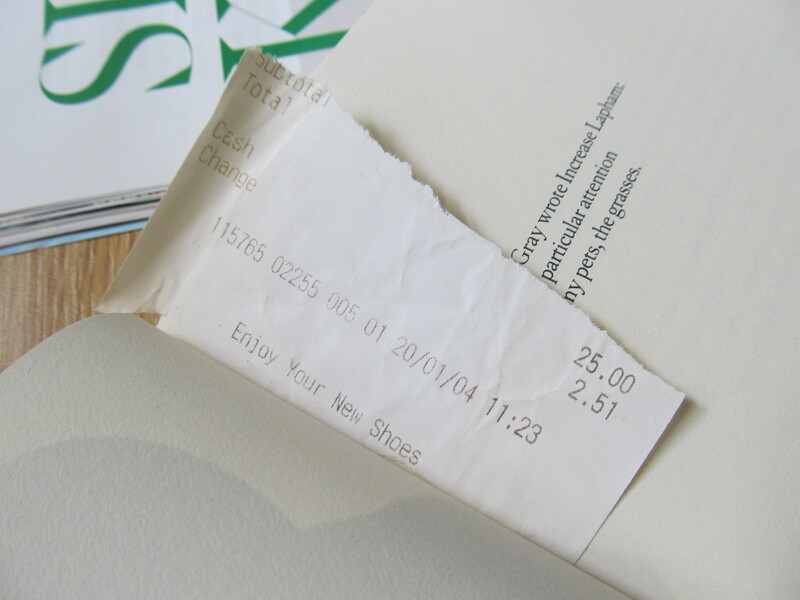 Bookmark in Ian Hamilton Finlay’s copy of The Granite Pail by Lorine Niedecker. This entry was posted in sharing little sparta and tagged sharing little sparta on 26/08/2016 by Peter Manson. 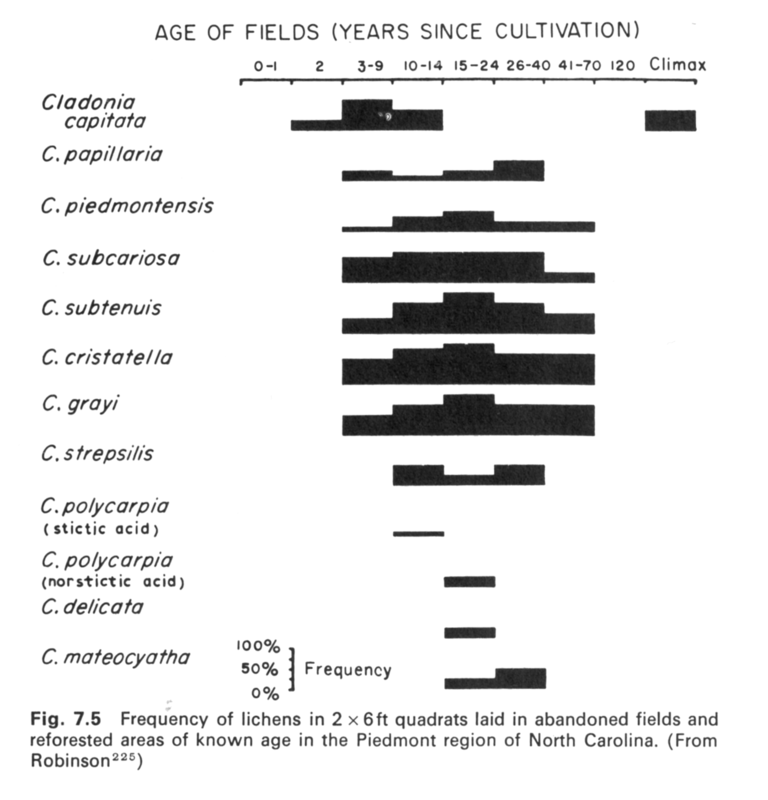 From Mason E. Hale, Jr., The Biology of Lichens (2nd edition; London: Edward Arnold 1974). This entry was posted in sharing little sparta and tagged sharing little sparta on 23/08/2016 by Peter Manson. It may be that of all the plants at Little Sparta, only the algal cells inside the all-pervasive lichen have no designs on this inland empire. Their fusion with fungal cells into a single organism seems entirely unbigoted, a mutually-beneficial collaboration between two distinct kingdoms of eukaryote life. But the mutualism isn’t clear-cut — it may be that the algae get nothing out of the association, and by some measures they suffer by it, algal cells dying to feed the fungal net which traps them, individual cells pierced by structures which in other fungi are the tools of unarguable parasitism. Unlike the fungal symbiont of a lichen, the algal or cyanobacterial symbiont can live independently, by photosynthesis, and often grows faster on its own than when incorporated into a lichen. 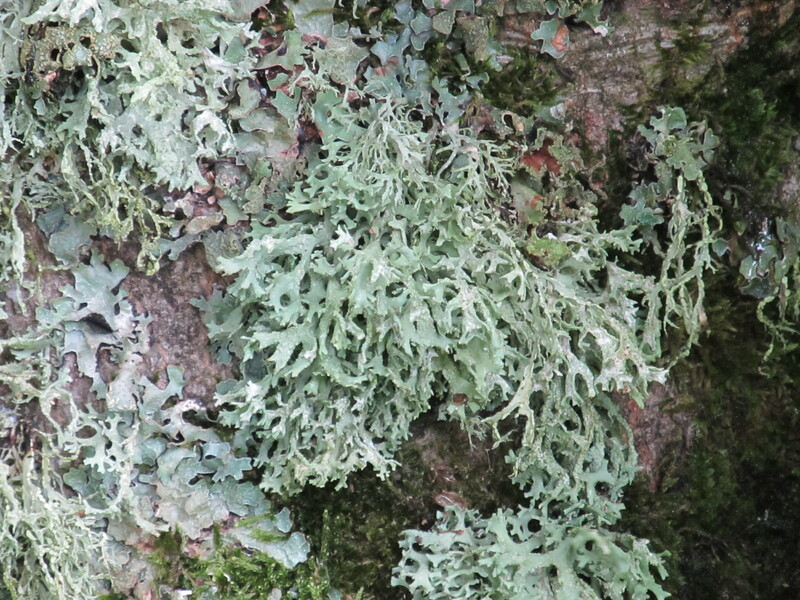 “Lichens are fungi that have discovered agriculture” – Trevor Goward. 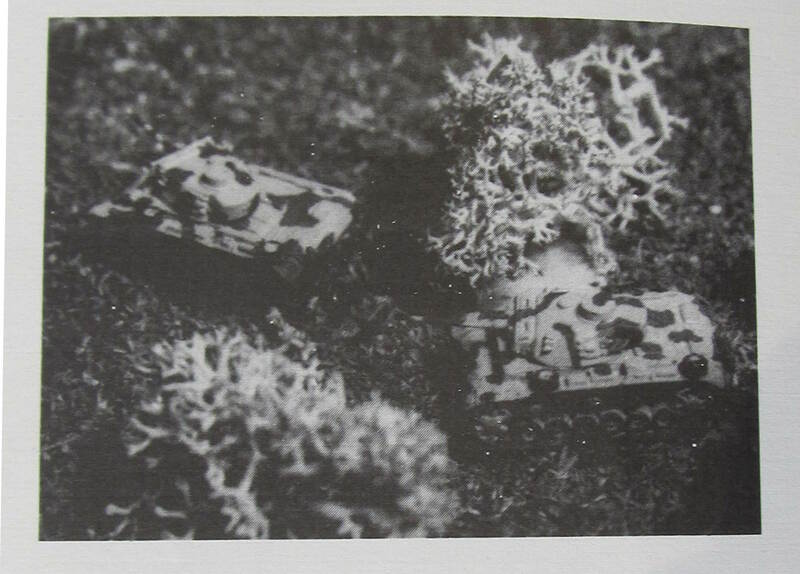 shows a group of toy tanks, in the shade of two clumps of fruticose lichen, making shift for trees or netting. 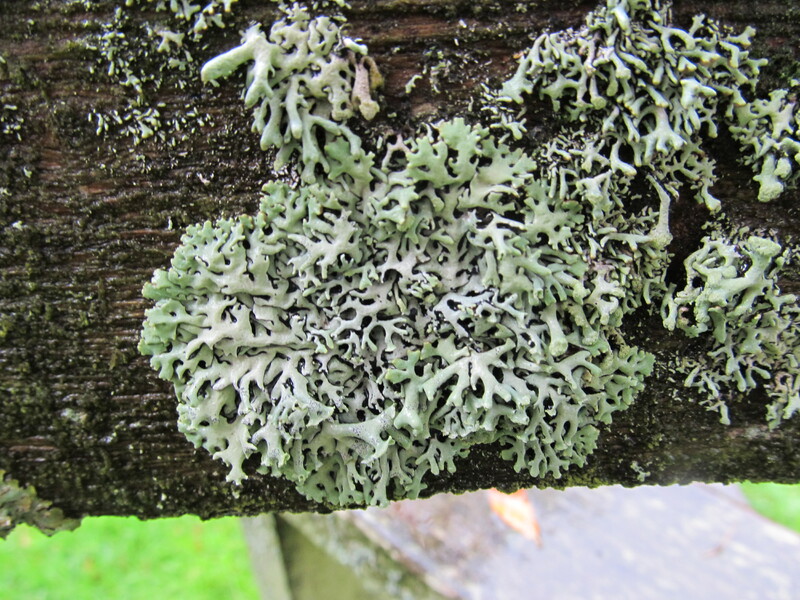 Lichen as camouflage: a well-aged garden is less susceptible to air-strikes. As a child in the 1970s, I was very fond of Observer’s Books, the series of pocket hardbacks published by Frederick Warne & Co. I think the first one I got was the 1975 edition of the Observer’s Book of Unmanned Spaceflight, though a few, including the Observer’s Book of Cacti, have a unicorn bookplate pasted in with my name on, printed in sharp pencil on the Book of Spaceflight, tentatively joined-up and in blue pen on the Book of Cacti. I had thirty or so, almost all about nature or biology or geology — I would never have asked for the Observer’s Book of Modern Art, or of Folk Song or Jazz, though I still wonder what those books could have been like. The only one I ever received unexpectedly was the Observer’s Book of Lichens, brought home by my mother from a jumble sale, priced 30p, at a time when the new books cost £1.50 or so. I don’t think either of us knew what lichen were, but she knew I liked the books, and I remember the weird excitement of its evening arrival. I remember too the slight strangeness of the object, the design a bit different, the dust-jacket not quite uniform with the others on the shelf. I read it, of course, but there weren’t really any lichen to see in Glasgow in the 1970s, when petrol was still leaded. It felt like an exercise in the acquiring of a purely abstract knowledge, the vocabulary of thallus, isidium, soralium, lecanorine not readily transferable, though I’ve used thallus once or twice. I gave the book away many years later, when some friends took up hill-walking and became interested in the lichen they saw. I always kind of regretted this, especially as lichen started appearing closer to home (I even have lichen on my windowsill in Ancroft Street now). When I arrived at Little Sparta, I knew I needed a guide to lichen — of all the volunteer laureates of the garden, the rosebay willowherb and the piggy-back plant, only the lichen are entirely anonymous to me. I bought a copy of The Observer’s Book of Lichens on abebooks. It’s an earlier edition, from the 1960s, not as good as the 1977 one I had (which is described, in The Observer’s Book of Observer’s Books, as “The best beginner’s guide to lichens available, and one of the best nature titles in the series”). I still don’t know one lichen from another. This entry was posted in sharing little sparta and tagged sharing little sparta on 21/08/2016 by Peter Manson. In the British Museum there is a rectangular conglomerate slab, known as the Shabako Stone, which is partly covered in Egyptian Hieroglyphics. The damaged inscription claims to be the transcription of a text from an ancient and worm-eaten papyrus onto a more permanent substrate. The text pertains to the god Ptah, whose words created the world and the gods. The stone was later repurposed as a millstone. The stone texts at Little Sparta stand at an interesting angle to the age-old argument between the permanence of poetry and the permanence of sculpture. Sculpture has the edge in that its plastic aspects can survive a culture whose language or written records have died beyond recovery. Poetry has the advantage of numbers, the song in the thousand mouths of a living tradition, the book dispersed in an edition so large that not every copy can be burnt, and then the reprints. The stones at Little Sparta stand in something closer to a scribal tradition than a sculptural one. Nobody expects them to last forever: their presence in the garden is the outcome of a continuing process of conservation, evaluation, repair and, when necessary, remaking, drawing on the skills and memories of Finlay’s surviving collaborators and the documents and photographs which record the garden in its many phases. Like my grandfather’s guillotine, which has had three new blades and two new frames, the garden is always itself, more or less, in the summer season when we get to see it, as if time had read it for a ruin and excused it from further decay. Immense effort and good judgement goes into making it so: the monthly reports of the gardeners are a fascinating education. But statues also die, and in Little Sparta, their life, which is their meaning, is a variably fragile thing. Their languages will survive, even if no-one speaks English or French, German or Latin in the next-millennium-but-one. We can (I can’t) still read the almost telegraphic Latin of the milestones and inscriptions which have been found along the length of the Antonine Wall, though seldom left there. Much of the language in the garden is self-reflective, or reflects in some way on its material context, and such language time-travels with ease. The SEA / PINK mosaic, the SEA in blue letters, the PINK in pink, emerges from a future muddy dig with a jolt of recognition, and if the name of the flower survives, a further small shock. The Panzer Leader tortoises, if fibreglass should prove indestructable, will still get a laugh, though I can imagine a world in its second innocence, where Panzer is no longer a name, just a word meaning “armour” or “shell”. The skull and crossbones with “ACHTUNG! / MINEN” might be taken literally — it marks the spot where electricity cables enter the garden, and the unfamiliar structure below might cause the dig to be halted and the front garden destroyed by a controlled explosion. Much will be lost, or turn abstract and mysterious. The French Revolution and the Third Reich will still be known, and their names and insignia noted, but they might come to seem almost simultaneous events, the last moves in an endgame whose upshot was ruin for the garden and everything outside it. What will survive will be the sense of this as a place where connections are made, between cultures and languages, across time, a concentration of finds, a “small holding”; evidence of a community of craftspeople working to a common purpose. Maybe a religious site. We know what each of these words means; we do not know what they said. This entry was posted in sharing little sparta and tagged sharing little sparta on 17/08/2016 by Peter Manson. Maybe nothing survives. Maybe everything survives. Maybe everything survives and nobody is left to know it. If every cubic centimetre of icecap were to melt, and it will, Glasgow would be reduced to a sparse archipelago of golf courses, cemeteries and Bishopbriggs. Little Sparta, 280 metres above sea level, will never be drowned. A direct hit from a meteorite could defeat it, but probably won’t. It’s miles from any infrastructure, so an unlikely target for nuclear weapons, unless some aggressor in the Great Patriotic War of 15th August 2026 should realise how seriously it would annoy Scotland, just at that moment, to have its single greatest artwork destroyed. Maybe the tentacles of half-submerged Edinburgh, reaching south from the Gulf of Newbattle, will stretch as far as Dunsyre, assimilating Little Sparta and turning it into an Urban Park. 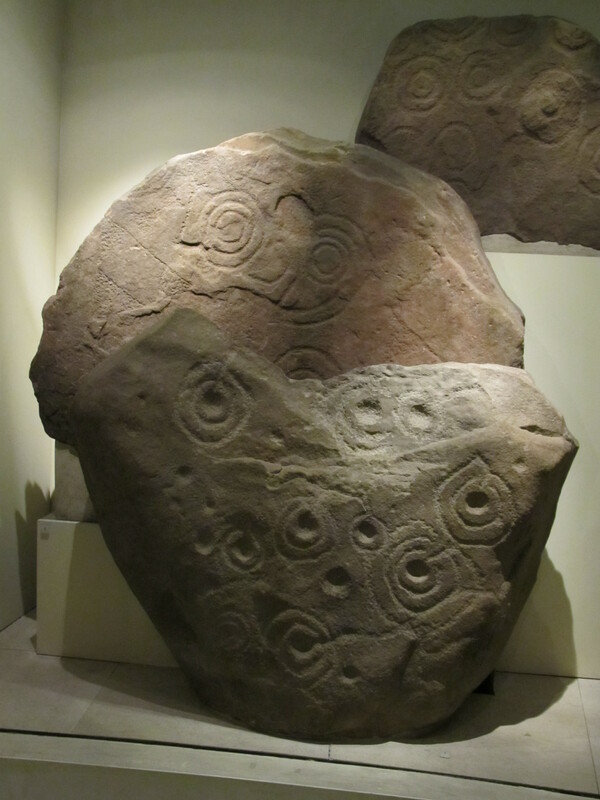 Maybe familiarity will lead to vandalism, and someone will take the difficult decision to bury the garden, or its stones at least, for protection, as the Cochno Stone in Faifley, with its ancient cup-and-ring carvings, was buried in 1964 by archaeologists from Glasgow University, to protect it from Faifley. It may be that nothing which survives into the very near future can ever really be lost. We are nowhere near being able to upload a human consciousness to a computer, but relatively simple things, like works of art, are not hard to digitize. Little Sparta has already been mapped quite carefully in GPS, the 3D laser scanner is now a standard part of the academic archaeologist’s toolkit, and advances in geophysics may one day allow for the digital excavation of long-destroyed sites. I imagine the space above a buried Little Sparta given over to an immersive virtual reconstruction of the garden, with virtual lichen growing on ray-traced stones, the season always summer, though often wet, with random fractal trees and clouds of cellular-automaton midges that buzz but can’t yet bite. The head gardener, George Gilliland, takes us on a tour — the recording was made in 2056, George is old now, brought out of retirement to share half a lifetime’s knowledge of the place. They made the poor man give his tour ten times over, recording every nuance and variation for aleatoric playback. The stone had been trimmed to fit the wall, with no regard paid to the carving, but the carved side was protected from erosion by its position inside the wall — the back and one edge of the stone are heavily weathered. It’s now in Biggar Museum. It’s a wonderful museum, and there’s not much you can do with portable antiquities other than put them in a museum, or bury them, but history tells me this stone is doomed. 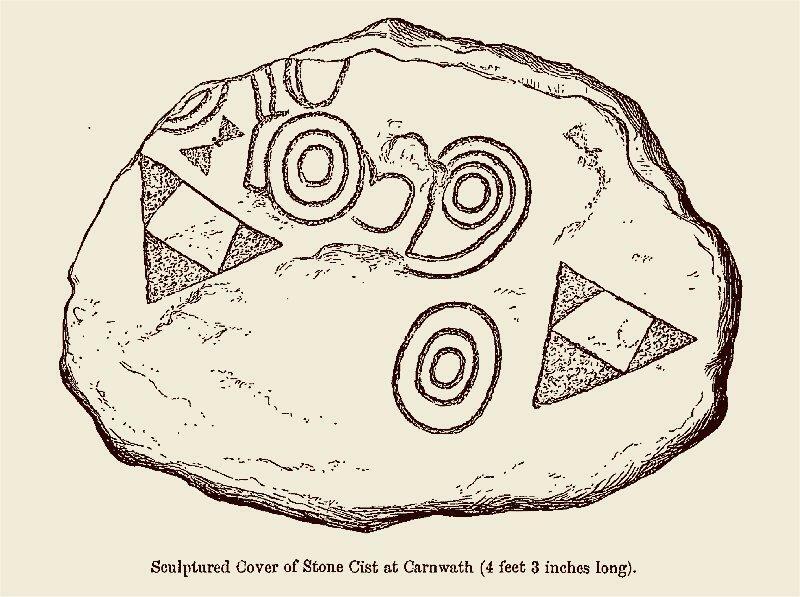 The archaeological literature is littered with descriptions of carved rocks which are sketched, contextualised, taken into private or collective ownership and then disappear without trace. If a carved rock isn’t earthfast, it has a half-life in captivity of perhaps fifty years. If it is, and is exposed to the elements, it erodes, often within a few decades. “There are plenty of ruined buildings in the world but no ruined stones” (MacDiarmid). I want to cry out for the ruined carved stones of Scotland, but MacDiarmid would tell me, “Those count as buildings too, Dummkopf”. Should we bury them all? Should we each take a stone down with us for protection, so the temporary sanctity of our burial places might rub off on the stones, granting them a stay of execution and confusing the hell out of future archaeologists, virtual or visceral? This entry was posted in sharing little sparta and tagged sharing little sparta on 14/08/2016 by Peter Manson.